Folk audiences hold their elders in particularly high regard and aren’t easily distracted by fashions or fads. 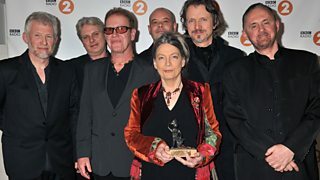 This was writ large at last year’s BBC Radio 2 Folk Awards, when the fruitful collaboration between June Tabor and Oysterband – two acts who first collaborated 20 years ago – swept the board. This was mostly considered good news by folk fans. It was a fine album, and the prizes were well deserved. But there was an element who, understandably, wondered aloud why younger acts hadn’t been better represented by the results. The 2013 Folk Awards take place in Glasgow next week, and the landscape has subtly, but significantly, changed. Sam Lee, that remarkable young promoter, singer, dancer and song-collector from Kentish Town, released his highly original debut album in 2012 and it’s already been recognised by a Mercury Prize nomination and by winning fRoots magazine’s Critic’s Poll. Sam has two nominations. Karine Polwart, Lau, Bellowhead, Jim Moray, Sam Sweeney and Duncan Chisholm are other acts receiving multiple nominations this year. Serial nominees some of them may be, but the music they are making is, pretty much without exception, fresh, inspired, modern and challenging. The scope and quality of the five records in this year’s ‘Best Album’ category is astounding. Of course, shiny awards are by no means the be-all and end-all, least of all in the folk world, with its assorted traditions stretching back hundreds of years. But, in the year that Bellowhead sailed up the charts and found themselves on Radio 2’s daytime playlist, the 2013 Folk Awards should offer further evidence that British folk music is enjoying another of its purple patches. Fans and critics who have yet to discover its delights are looking over and wondering once again what the fuss is about, and I sincerely hope that, after the Folk Awards open the door to the folk world, they’ll step inside and bide a while, for the music and the company is among the best they will ever find. I for one am thrilled to be getting more closely involved at this time. - Mark Radcliffe hosts the BBC Radio 2 Folk Awards at Glasgow’s Royal Concert Hall on Wednesday 30 January. Listen live on Radio 2 from 7.30pm, or watch all the presentations and performances on the BBC’s Red Button TV service or the Radio 2 website.